This is a one day guided tour in the vicinity of Varna. You will visit Aladzha Rock Monastery, the park-museum “Vladislav Varnenchik”, the old glass production factory in Beloslav, Devnya and the Museum of Mosaics as well as the Stone Forest (Pobiti Kamani). You will be picked up from your accommodation or hotel in Varna at approximately 9am. Your first stop will be the Aladzha Rock Monastery, situated in a beautiful area 14 km north of Varna, near Zlatni Pyasatsi Resort (Golden Sands Resort), in the center of Zlatni Pyasatsi Nature Park (Golden Sands Nature Park). There are no reliable historical records as to when the monastery was established, but there is evidence that it already existed in the 10th – 12th centuries. Your next stop will be the park-museum “Vladislav Varnenchik,” a memorial complex and a unique park, situated at the place of the battlefield from 10/11/1444, where the Polish- Hungarian King, Vladislav Yagello lost his life. In the exposition, visitors can see arms and equipment from the 15th century, found on the battlefield as well as paintings, sculptures, prints and other works of art. Your next stop will be the old glass production factory in Beloslav, which preserved and developed the production technology of the Beloslav glass factory founded in 1893. The production list includes about 400 items produced in one furnace for automated production of glass phials up to 150 ml and three furnaces for blown glass, clear and colored glass. You will have the chance to see live demonstrations of hand-made glassware craftsmanship. Qualified experts present the technologies employed to turn sand, calcined soda and limestone into melted glass, as well as the tools and skills used by the craftsmen to blow and shape glassware pieces. At the demonstration hall the blowing of souvenir articles, as well as their decoration and inscription by skilled glass-blowers is observed. On request, visitors can take a hand at blowing a glassware of their own. After the factory you will have lunch in a nice restaurant in Devnya serving traditional Bulgarian food. Next comes the town of Devnya, where we will visit the “in situ” museum of Roman mosaics and Ronam villa of the 3rd through the 4th centuries. A big Roman building with exquisite mosaics was discovered in this place during archaeological excavations carried out in 1976. The museum was constructed over some of the foundations of this building. 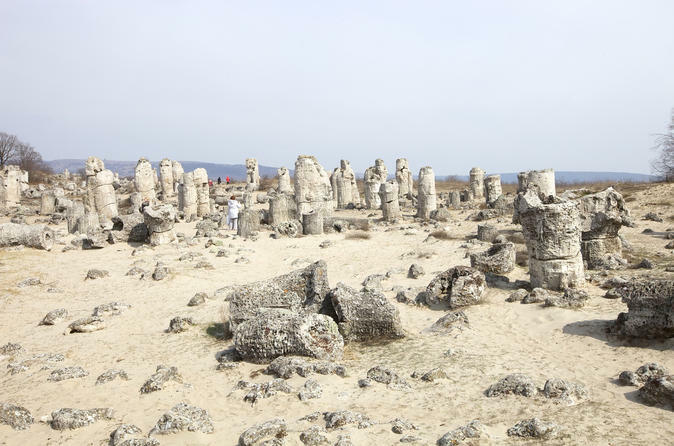 The last stop for the day will be the Stone Forest, a fabulous natural phenomenon, mostly known by its Bulgarian name of "Pobitite Kamani," which means "stones beaten into the ground." The spectacular landscape of "Pobitite Kamani" is a spotty spread in a North - South orientated belt about 3 km wide and 8 km long. The stones are clustered in seven large groups and several separate small areas embracing a total area of more than 7 square kilometers. Тhe main group, the "Dikilitash" group is the most impressive and in the best state of preservation. Your tour will conclude in the late afternoon in Varna.